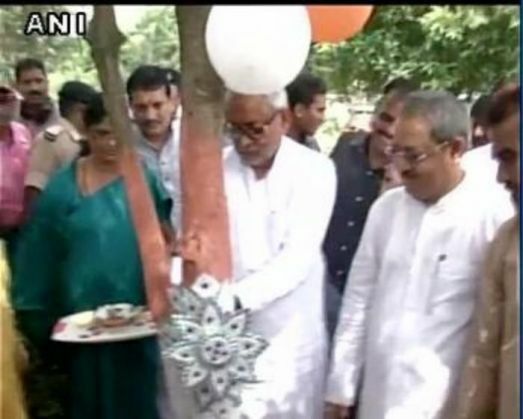 Bihar Chief Minister Nitish Kumar tied rakhi to a tree at Rajdhani Vatika on the occasion of Raksha Bandhan here today. Greeting all the brothers and sisters on the occasion, Nitish said, "We have started a tradition of tying rakhi to a tree on this auspicious day." "The motive behind the start of this tradition is to safe guard and conserve the trees in the same manner as is done by the brothers for their sisters," he added. This Hindu festival, which celebrates the love and duty between brothers and sisters, is primarily observed in India, Mauritius and parts of Nepal. It is also celebrated by Hindus and Sikhs in parts of Pakistan and by some people of Indian origin around the world. On Raksha Bandhan, sisters tie a rakhi (sacred thread) on her brother's wrist, which symbolizes the sister's love and prayers for her brother's well-being and the brother's lifelong vow to protect her.